Slauerhoffbrug 'Flying' Drawbridge | OhGizmo! How Did Stanley Manage To Squeeze An LED Flashlight Onto Something As Small As A Watch? 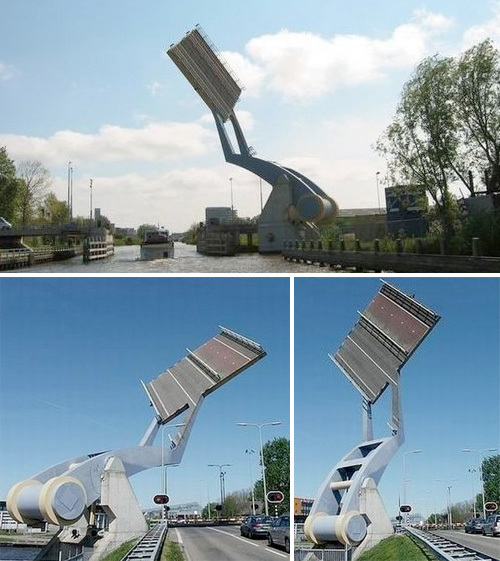 Not only does this cantilevered drawbridge known as the Slauerhoffbrug in Leeuwarden, Netherlands look pretty amazing when it’s hoisting a section of the bridge into the air to let boats through, but I have to assume/desperately hope it doubles as a gigantic catapult when traffic is slow. Unfortunately something tells me that pesky ‘public safety’ issue would put a kibosh on those plans though. ← How Did Stanley Manage To Squeeze An LED Flashlight Onto Something As Small As A Watch? I hope no cars or pedestrians get stuck on the bridge when they raise it. I agree with Franco, I hope they have a lot of safety measures to prevent it from lifting. Because drivers can be stupid and want to take the chance of making it across before it does, and get stuck on things like this.